The Minister for Defence, the Hon Christopher Pyne MP, and Minister for Defence Industry, the Hon Steven Ciobo MP, were there to welcome the aircraft and RAAF fighter pilots who flew the final leg in the journey from Luke Air Force Base Arizona. Minister Pyne said the Joint Strike Fighter will be a game-changer for the Australian Defence Force. “This is the most advanced, multi-role stealth fighter in the world. It will deliver next generation capability benefits and provide a major boost to our intelligence, surveillance and reconnaissance capabilities,” Minister Pyne said. The Government is investing over $17 billion to acquire at least 72 Joint Strike Fighters. “The Joint Strike Fighter is the largest acquisition in the history of the Royal Australian Air Force, and is a key part of the Government’s $200 billion build up in Defence capability,” Minister Pyne said. The Lockheed-Martin-built Joint Strike Fighter will be operated by nine partner nations, reaffirming and strengthening Australia’s alliance with the United States and other key international partners including the United Kingdom, Italy, Netherlands, Turkey, Canada, Denmark and Norway. “In Australia’s immediate region, Japan and South Korea are in the process of procuring the F-35A Joint Strike Fighter, and are closely aligned with Australia’s pursuit of shared strategic, security and economic interests,” Minister Pyne said. Minister Ciobo said the aircraft created significant opportunities for Australian defence industry that was creating new jobs. “Australian industry is manufacturing parts that will be fitted to every F-35 in production globally, and more than 50 Australian companies have directly shared in $1.2 billion in production contracts to date,” Minister Ciobo said. The two aircraft arrived in Australia following a cross-Pacific ferry from Luke Air Force Base Arizona and will be operated by the Air Force’s Number 3 Squadron. The F-35A Joint Strike Fighters will be based at RAAF Base Williamtown and at RAAF Base Tindal in the Northern Territory. Australia’ has taken delivery of two of its ultra-expensive, state-of-the-art fighter jets. The two F-35A stealth fighters have arrived at Williamtown RAAF Base, near Newcastle. More than 50 of the aircraft will eventually reside at this one base, with a further 12 or so on rotation to Tindal Air Force Base in the Northern Territory. Flanked by the ageing F-18 Hornets they’re set to replace, the first two F-35s landed at RAAF Base Williamtown on Monday after flying from RAAF Amberley in south Queensland, where they arrived from the United States last week. Aviation enthusiasts gathered on the edge of the base from early in the morning and more watched a flyover of Newcastle ahead of the state-of-the-art aircraft’s official welcome by Defence Minister Christopher Pyne. The Royal Australian Air Force has taken delivery of nine early-model F-35As. The remaining seven continue to operate out of a US Arizona training facility. The federal government will spend a total of $17 billion on 72 of the F-35 aircraft, with the cost being widely criticised, including by US President Donald Trump. The project is widely cited as the most expensive in history, with the total projected cost - once research, development and sustainment is factored in - estimated to be over $US1 trillion. And there are fresh concerns the fighter cannot maintain its main redeeming feature — stealth -- especially in Australia’s harsh climate. Reports state the F-35’s radar-absorbing coating is wearing off far faster than expected. The composite material may need to be replaced after every flight. The coating is so sensitive — and so important — that a simple scratch could expose an area large enough to act as a beacon to modern radar systems. Click here for the full story, on the News Corp Australia website. NEWCASTLE, Australia --- Australia's first two locally-based F-35 fighter aircraft arrived on home soil today at Royal Australian Air Force (RAAF) Williamtown, signalling the dawn of a new era for the nation's defence capabilities. Lockheed Martin designed and built Australia's fleet of F-35s and also serves as the global industry lead for F-35 sustainment. The most advanced fighter jet ever built, the F-35 will be a catalyst for the transformation of the Australian Defence Force (ADF), utilising its sensors and low observability to operate with impunity in contested airspace and fuse a picture of the battlespace for other air, land and sea assets. Along with its advanced weapons capacity and superior range, the 5th Generation F-35 is the most lethal, survivable and connected fighter in the world. "The arrival of the first F-35 aircraft to be permanently based in Australia is a historic occasion and we are proud of our role as the 5th Generation design pioneer and F-35 original equipment manufacturer," said Chief Executive of Lockheed Martin Australia, Vince Di Pietro AM, CSC. "We congratulate the RAAF, the ADF and all of our Australian industry partners who have worked to make this achievement a reality." Australian suppliers play a significant role in the F-35 program with more than 50 Australian companies contributing to the global program of record of more than 3,000 aircraft. To date, the F-35 program has secured more than 2,400 highly skilled jobs created and generated more than $1.3 billion AUD in contracts for Australian industry. "Flown by Australian pilots, maintained by Australian maintenance personnel and containing many best-of-breed advanced components made right here in Australia, all Australians have every reason to be proud of this achievement," Di Pietro said. "Australia plays a significant role in the program with a suite of local industrial technology and know-how behind the hundreds of F-35s flying today, as well as the thousands of F-35s that will be produced in the future." Lockheed Martin is the industry lead for F-35 global sustainment and is working in partnership with the Australian Defence Force and local industry to provide sustainment support and realise the full potential of the F-35 as an integrated force multiplier for decades to come. Australia's has committed to 72 F-35As, which will be flown by Australian pilots, and maintained by a joint team of Australian maintenance personnel and industry partners including Lockheed Martin Australia. 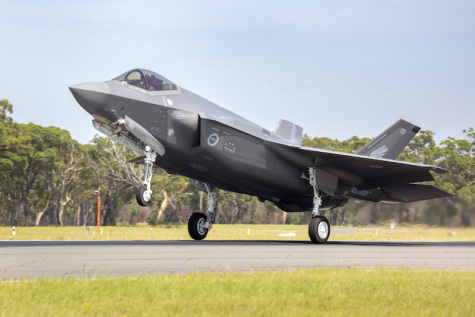 Australia has received 10 aircraft to date, the remainder of which are stationed at Luke Air Force Base in Arizona where they are part of the international cooperative F-35 training operations. Ten nations are currently flying F-35s, and with today's arrival, Australia becomes the 7th nation with F-35 aircraft based locally on their home soil, joining the United States, United Kingdom, Italy, Norway, Israel and Japan. Additionally, with the formal stand-up of RAAF Williamtown, F-35s are now operating from 16 bases worldwide. More than 340 F-35s are operating today, more than 700 pilots and 6,500 maintainers have been trained and the F-35 fleet has surpassed more than 170,000 cumulative flight hours. BAE Systems Australia today congratulated the Royal Australian Air Force and Lockheed Martin on the arrival of the first two F-35 Joint Strike Fighters to Williamtown, NSW. “It’s an incredible milestone in this amazing global program and we are proud to be a tier one program partner. “BAE Systems has been at the heart of the design and development of the F-35 from the beginning; and we will use this expertise to support its entry in to service with the Royal Australian Air Force. “We expect that our F-35 sustainment activities at Williamtown will see about 400 jobs created over the next 10 years and a requirement for this level of employment over the 30 plus years of the contract. “Sustainment activities will also create opportunities for our Australian partners and supply chain.